We Run for the Yazidi. | Do. Be. Interesting. Home Adventure We Run for the Yazidi. We got off to a late start, pinning on our numbers as we started running with the slackers. 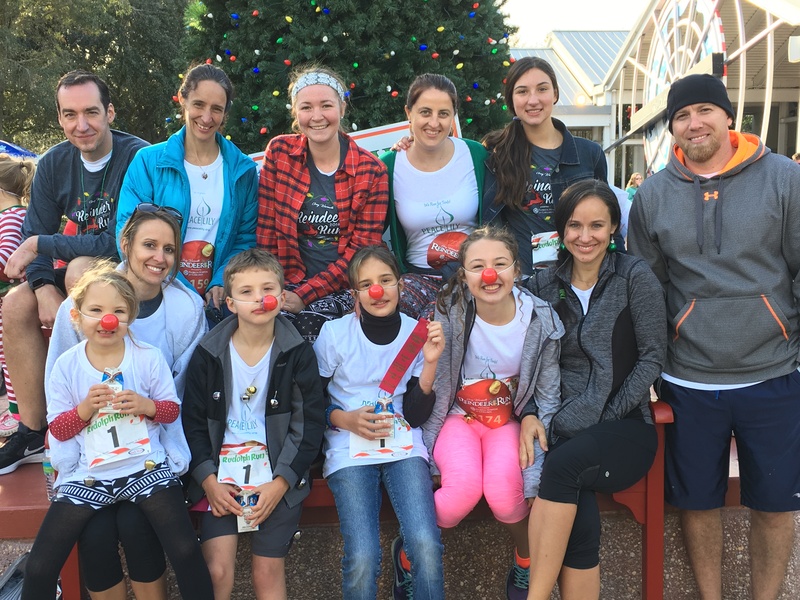 It was the Reindeer Run at Sea World in Orlando. I have it on good authority that Sea World soon won’t have animals anymore thanks to the BlackFish documentary. They’ll be replacing the whales with theme park rides. Maybe a virtual reality tour. Every time I hear something about caged animals, I feel a pang of guilt from my childhood. I grew up deep in the hundred-acre woods, exploring, building forts, and later, starting fires. Right up until I started reading my dad’s book on BASIC programming for Radio Shack’s TRS-80, which would forever change my life. During one of my deep woods explorations, I came across a large mud puddle. I fished about a dozen bright orange salamanders out of the puddle and excitedly brought them home to spoil them with their own little kingdom. I created a salamander utopia in a large box on the porch, replete with sandy beaches, pools of fresh water, and lots of tasty green delights. I actually wasn’t sure what salamanders ate, but I figured I would start with grass and leaves, and if they didn’t like those, I’d eventually figure it out when I got to the library and read up on the diet of a salamander. If only I had had the vast resources of the Internet at my disposal! My little orange salamanders were just so cute with their tiny little toes and beady black eyes! Sadly, their perfect world turned out to be more of a house of horrors as every last salamander turned to a dry husk within two days. I’m so sorry, little salamanders. I guess the silver lining is that, since that experience, I have not wanted to imprison another animal, even with the best of intentions. So on we ran for the Yazidi. Past the pink flamingos (ooh!). Through the fake falling snow (aah!). I didn’t even know who the Yazidi were. But at the Peace Lily Open House, Ben told us about his recent visit to one of their refugee camps in Iraq. Something about their plight really touched him. The Yazidi religion alienates them from both Christians and Muslims, and they are actively persecuted as “devil-worshipers” by ISIS. They are now refugees in their own country and desperately in need of basic necessities such as shelter. Ben and Eve are not the type to sit around when there’s something that needs to be done. No, they’re the type that you just want to get behind and support and watch them go. So of course within the next couple of months they birthed Peace Lily Foundation, named after their daughter. And this is why I’m sweating at Sea World in this white Peace Lily t-shirt. Waiting for Slowhanna to cross the finish line so we can go eat our cookies and drink our chocolate milk. And later, it’s why I’m propping one eye open eating even more cookies and chocolates while Eve, energized by the long day of preparation and guest entertainment, tackles the mountain of dishes. Yes, entertaining a burgeoning houseful of guests actually energizes her. Fast forward a couple of weeks to when I’m chatting with a friend who is politely trying to get off the line. I just love it when my friends make loads of money. They always do good things with it. Like support their families and give to good causes. It’s one of the reasons why I was proud to help carry on Bill Gate’s dream rather than Steve Jobs’. And why I begrudgingly allowed Bill to leave Microsoft. Anyway, back to my friend giving away money. “I can certainly help you with that!”, I said. “Poor wandering bachelors do not make the list”, she said. So I told her she could support my Peace Lily 5K after the fact. And since I had already completed it, there would be no risk of failure. And she fell for it! So the joke is that I brought in more money for the run than everyone else put together, after refusing to fundraise. A need effortlessly matched up with a surplus. Isn’t it interesting how these things work out? Sadly, I never saw another orange salamander the entire time I was there. I may have single-handedly finished them off. Anna, my sister reminded me of finding and caring for a baby squirrel. I had completely forgotten about that! Must have subconsciously blocked it out. Is that the squirrel you remember? I feel so bad for those poor little salamanders. But don’t feel too bad, I am sure that there are thousands more of those little orange zippies on the earth. I am glad you raised some money. David, that was the squirrel I was thinking about! I can’t believe I forgot about that poor squirrel. I will have to write him into one of my posts. He deserves at least that much. ?